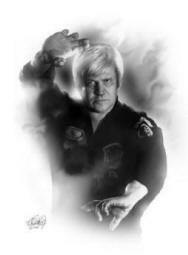 American Kenpo was developed by Ed Parker Sr. as a means to deal with altercations in a "street" environment. While being designed for the street, it in no means lacking in a room of intellectuals either. While many believe that its most noteworthy aspect is the speed, power and precision of its practitioners, in actuality it is the depth of knowledge contained and inherent within its many facets. The system can be broken down into 3 basic divisions: Self-Defense Techniques (which it is known for), Forms (and Sets, which are isolation drills) and Freestyle (better known as Sparring). Each of these parts are a microcosm unto them selves, with theories, principles and concepts that govern the reasons that things are executed in a specific manner. Through the study and understanding of these theories, principles and concepts the student acquires not only a better understand of physical conflict resolution but learns about themselves as well. Courtesy of Ed Parker Jr.